Adam Perry (@Peza100) joins us again, where we follow him on his summer pilgrimage to watch his beloved Red Sox, sort of. As part of an unofficial pre-marital agreement, I am allowed to up and leave the family every two years to make a pilgrimage across the Atlantic to see my beloved Red Sox. This Summer I travelled to a new city and ballpark to enjoy a three game series at Minute Maid Park, the home of the Houston Astros. An essential part of each trip is to attempt to catch one game of ‘Smallball’ (Minor League Baseball). While Texas is home to countless minor league teams, none of the games either fitted in with my schedule or were less than a 2 hour plane journey (remembering of course that Texas is larger than France). After some additional research, I discovered that Houston does have another pro-ball team ‘The ScrapYard Dawgs’ based just 30 minutes north of Houston. The Dawgs are part of the only professional US women’s softball team in the US, The ‘National Pro Fastpitch League’. The league has been going since 2004 (There was a previously unsuccessful incarnation between 1997 and 2001), with just six teams in the league: two in Texas, one in Ohio, one in Florida and one from Beijing (based in the US but made up of Chinese-international players). The season lasts for approximately three months between June and August. For anyone not familiar with softball, the game has the majority of the same rules as baseball, the main difference being the size of the ball (bigger), field (smaller) and balls are pitched underarm. There are also seven innings compared to the nine we’re accustomed to in baseball. Less than 24-hours off the plane with little chance to acclimatise to the scorching Thursday Texan heat, I made my way to the impressive Scrapyard Sports complex. The area comprised of several softball fields — mainly utilised by local teams and schools — as well as being the home of the Dawgs stadium. The stadium itself was small but perfectly formed with seating available around the baselines with an impressive scoreboard in left field. The reserved seats (the front few rows) will cost you a mere $15, with the lesser seats coming in at $10. Being keen and arriving early, I made my way to home plate to sit in the front row centre (yes I splashed out the extra $5). I have not, or will ever have a better seat at any sporting event. 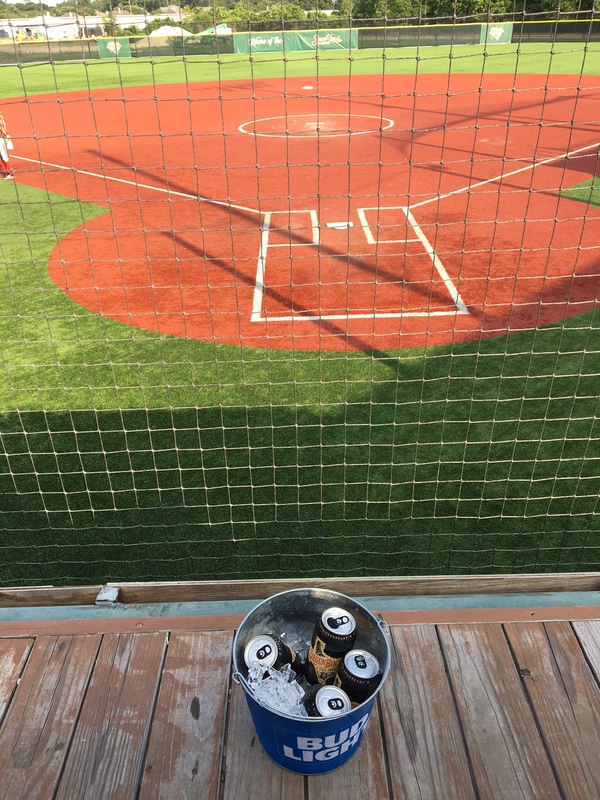 Concessions are limited but another $15 will get you 5 cans of Texas’s finest amber ale ‘ZiegenBock’ with your own bucket full of ice. You’ve got to drink cold beer quickly in Texas. Considering I was forced to pay $11 for just one beer in Minute Maid Park, this is a budget friendly option wherever you are. Don’t worry; it’s not Bud Light in the bucket! With a shared pre-disposition for ‘ZiegenBock’, I made friends instantly with some of the locals who sat alongside me in the prime seats. Texans are extremely friendly and conversation flowed well along with the aforementioned ale. Looking around the ballpark it seemed there were probably only a few hundred people in attendance, those at the game did inform me that attendances are much larger during the weekend. The team have only been in the area since 2015 and it seemed from speaking to locals prior to the game, they are still a largely unknown quantity. Onto the game itself, my adopted Scrapyard Dawgs were taking on the Akron Racers from way up north in Ohio. 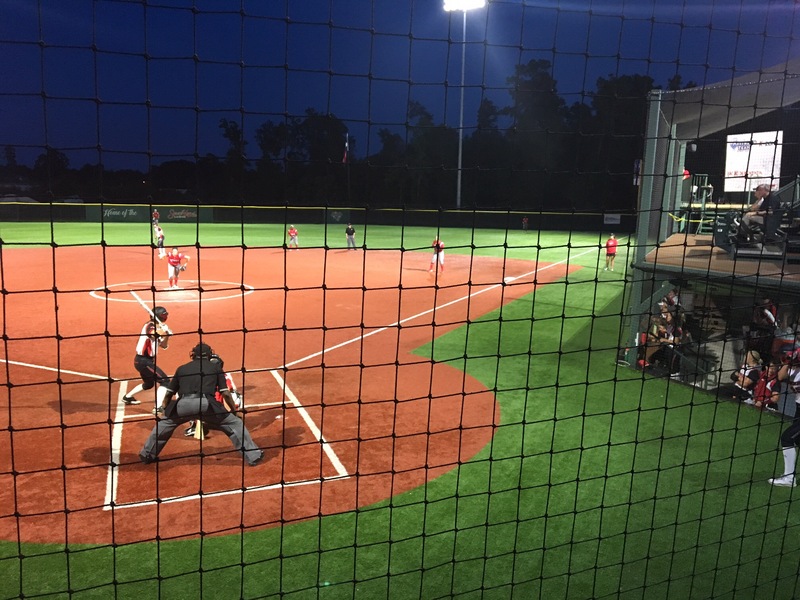 Having never watched a live softball game before, I was surprised at just how fast the balls were pitched underarm (at between 70 and 80 miles per hour). The wind-up action and speed gave my shoulder phantom pains, but not enough to have to put the ZiegenBock down. Sadly for the Dawgs, the starting pitcher was on this occasion neither particularly fast nor accurate, giving up 4 runs in the top of the first, a score line the Dawgs never recovered from. You would not have known the score from the support given for both team by the benches. Both sets of players cheered their team on to the end, often breaking into chants in support of particular players. This was great to witness and not something often seen in the world of professional sport. One of the other fascinating distractions was to see the charge of the children run after foul balls or home-runs. As the announcer regularly chanted “You find it…you keep it” and the kids did not need any further encouragement. The son of one of my new friends brought me back a big yellow foul ball as a souvenir on one of his many excursions. Fastpitch Softball is as it states, fast and furious, every bit as much as it’s small ball 9 inning counterpart. The balls gets to the infield quicker, and due to the size of the ball, you are likely to get lots of big hits. The Dawgs rallied late on, but despite the best efforts of the chanting benches, they went down 6-4. Akron went back north with the win and the series by 2-1. At the end of the game, both teams lined up sitting behind tables ready and willing to sign balls and pose for photos. I had a chance to have a quick chat with the Dawg’s charming first baseman Britt Vonk. Britt, originally from Holland is one of the many international players in the League. 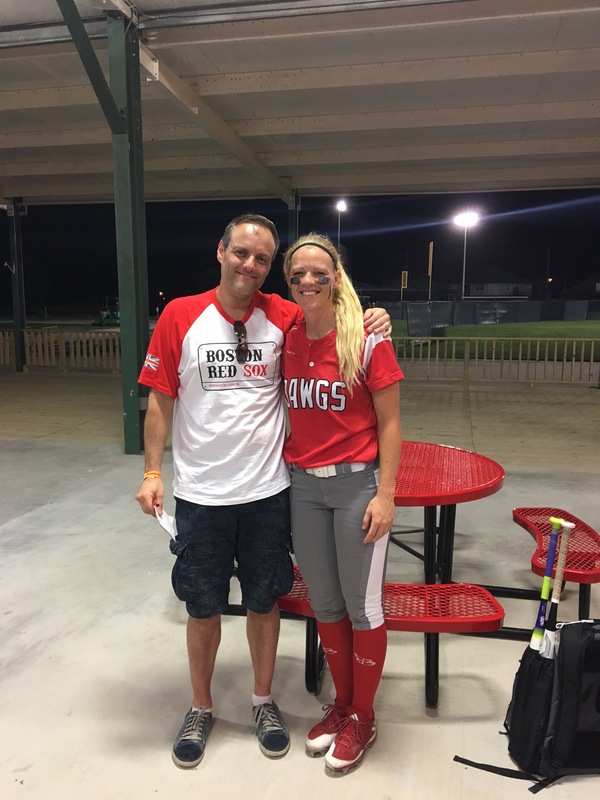 Thankfully for Britt and all the talented softball players globally, the game is making an Olympic comeback in Tokyo 2020. Unlike baseball, the games will feature the best players in the world from both the women’s and men’s game. The National Pro Fastpitch League will help create some of the stars that will be on display in Tokyo and beyond. Despite the fact that I went on to see my Red Sox win a thrilling series 2-1 against the Astros, it will be my evening at ‘Dawgs Stadium’ that will be best remembered from my latest trip. The proximity to the field and the accessibility of the players all helped to make it an authentic and personal experience. The league is still limited in its reach across the US and clearly crowds need to increase, but I would hope that this would happen the closer we get to 2020. 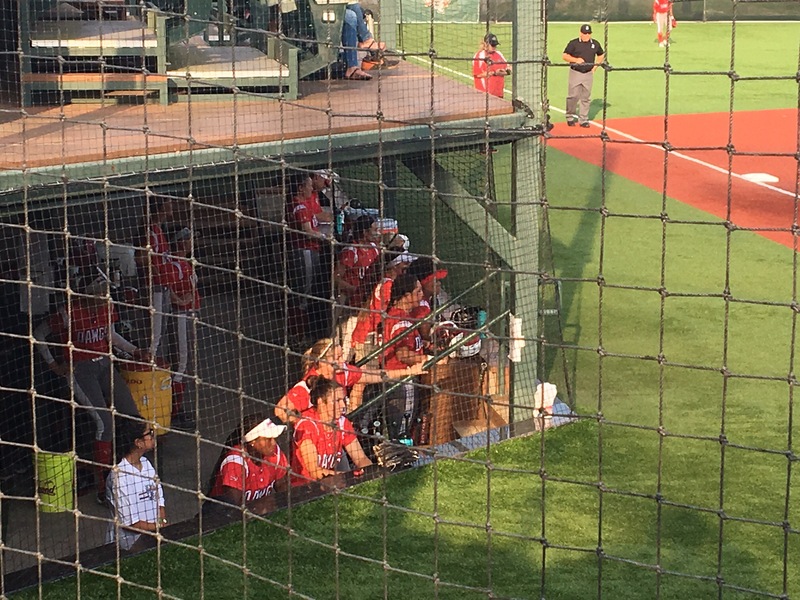 If you do find yourself over in the States either as a baseball tourist or not, I cannot recommend the National Pro Fastpitch League highly enough. You will get a warm welcome, a unique experience and almost as importantly, reasonably priced beer!